When yet another endangered Mexican wolf turned up dead this week (at least 36 of the critically endangered subspecies have been shot in recent years), things looked pretty grim for her mate, who went missing the same time her corpse was found. But, there’s some good news: the male of Morgart’s Pack appears to be okay. His radio collar was detected still moving in this week’s telemetry flights. F1106 and M1155 started travelling together this spring, so biologists considered them a pack. They were called Morgart’s Pack, after John Morgart, a willdlife biologist who ran the reintroduction program and personally campaigned for the wolves; he died in October, 2009, of cancer. When two wolves go missing at the same time–as has happened twice–wolf watchers are highly suspicious there was foul play. But, he’s okay. Spokesmen for Arizona Fish and Game tried to assure everyone that just because he was missing, that didn’t mean he was dead. But since they are so tight-fisted with information to people on both sides of the wolf issue, no one really trusts them. Wolf expert Jean Ossorio (who passed on the good news about M1155) points out that F1106 wasn’t officially blamed with killing cattle (as I had implied) before she was moved; she was a juvenile. We still have no idea what killed F1106. The official word is that it’s under investigation. 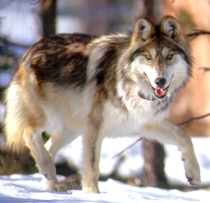 The monthly reports also describe some of the known shootings as “under investigation.” Nine cases going back to 2008 are listed by the USFWS as “awaiting necropsy.” They can’t even up with all the wolf dead bodies; there are five this year and they’ve only listed one. Instead of spending time reporting information people might actually be interested in, AZFGD workers tediously list every boy scout troop or cattlemen’s association they talked to in the last month. I don’t think it would be asking too much to offer a preliminary finding in the reports and public statements. Was there a gaping bullet hole? A tire tread? We’re not talking CSI Wolf here. It’s that kind of attention to detail the reports are missing. Illegal shootings are the top cause of death for the Mexican gray wolves, so when there is not even a cursory explanation, it’s natural to assume that it was the case.